This critical object is based around the idea of of a feedback cycle, where data that has an innate bias in it continually gets fed into a system where the output seems uncontaminated but contains remnants of the biased data within it. The system is an organic representation of those black box systems. Having a dropper of durian essence, an extremely pungent fruit that can fill a room quickly, fall onto a flower which acts as the output of the system. The liquid then creates an odd sensation where a flower which is usually associated as beautiful and pleasant smelling is now revolting. 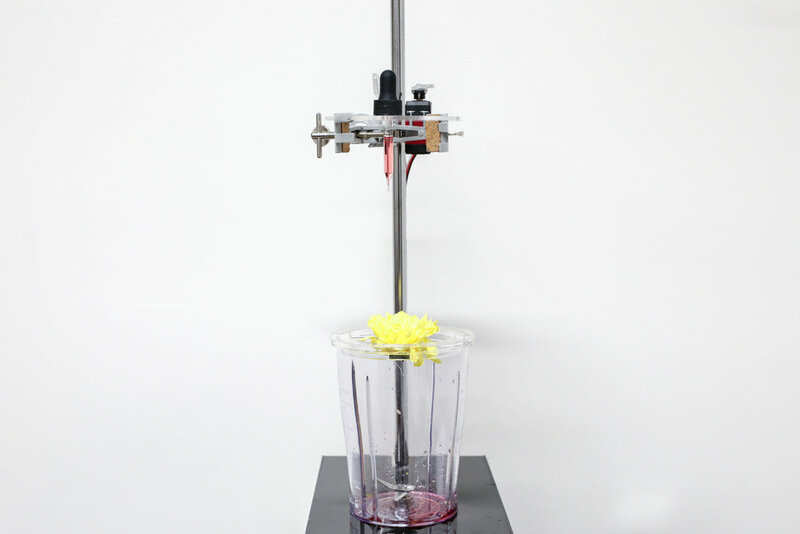 The final piece of the system is that the flower has a chance of falling into a blender and being chopped up. This is partially to make a statement about how the American criminal justice system can be a crap shoot and to say that it can have permanent effects on those who fall into it for one reason or another. Working around the topic of systemic bias, more specifically that of predictive policing and their use of artificial intelligence. This piece from ProPublica was eye opening to us and helped to shape the framework of the awareness machine we created. The prompts that sprouted this object were to contain an organic element, while conveying surrealism, and emoting anxiety.